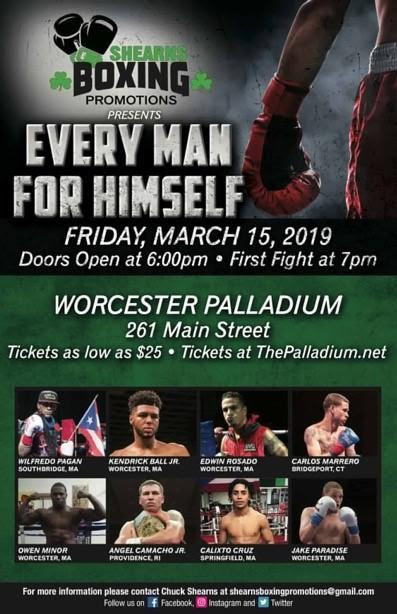 New England’s newest promotional company, Shearns Boxing Promotions (SBP), held a press conference today to formally announce the presentation of its inaugural event, “Every Man For Himself,” on Friday night, March 15, at The Palladium in Worcester, MA. SBP’s philosophy is to promote entertaining, competitive fights, featuring several fights between New England boxers. Five of the eight fights on SBP’s inaugural card, for example, pit N.E. vs. N.E. fighters. Worcester fan favorite Kendrick “Peppa” Ball, Jr. (11-1-2, 8 KOs) will face an opponent to be determined in the six-round main event for the vacant New England Middleweight Championship. In the co-featured event, undefeated Providence light heavyweight Angel Camacho, Jr. (15-0, 5 KOs) returns to the ring in a six-round bout versus Taronze Washington (17-26, 9 KOs), of Dallas. Always tough Lawrence, MA junior welterweight Agustine Mauras (6-4-3, 3 KOs) throws-down with Oscar Bonilla (5-3-1, 1 KO), of Bridgeport, CT, in a six-round match. One of Worcester’s most celebrated amateur boxers this century, heavyweight Owen Minor, will make his professional debut in a four-rounder versus Corey Morley (0-2-1), of Philadelphia. Undefeated Southbridge, MA welterweight Wilfredo “El Sucaro” Pagan (5-0, 3 KOs) takes on upset-minded Peruvian Carlos Galindo (1-7), fighting out of Woburn, MA, in a four-round clash. Also fighting on the undercard, all in four-round fights, are Springfield, MA lightweight Calixto Cruz (1-0) vs. Saco, ME’s pro-debuting Llamar Kelly, Worcester cruiserweight Jake Paradise (0-2) vs. Francisco Artri Neto (0-2), of Woburn, MA, and Bridgeport, CT junior lightweight Carlos Marrero III (0-2-1) vs. Worcester’s Edwin Rosado (1-8-1, 1 KO). Jimmy Burchfield (CES Boxing promotes Kendrick Bell, Jr. and Angel Camacho, Jr.: “CES Boxing and Chuck, we know business, and we know it takes family. We’re honored that he’s stepping up to the plate. Promoting a show is a monstrous job. Life is a family. General admission tickets are priced at $25.00 and available to purchase online at thepalladium.net. Boxers on the card have $50.00 and $25.00 to sell.